Gulf Shores condo for sale at Navy Cove. 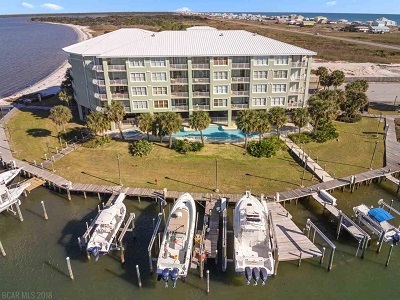 Bring your boat to this bay front condo, minutes from the intracoastal or the lighthouse! Featuring the best of both worlds - bay front beach with a deeded boat slip and walking distance to the gulf. This 3BR/2BA furnished unit is a really nice, well kept unit with a patio view of the bay front beach. Hardwood flooring in the living area, granite counters in the kitchen, the unit has classic materials and a great breakfast view overlooking the beach. The master bedroom and bath offers a jetted tub and separate shower. All three bedrooms have affixed TVs on the wall. The unit has stacked washer/dryer units in the hallway. The unit has great rental income and has recent repeat guests.